Ambiance app for iPhone, according to its developers, is an ‘environment enhancer’ that’ll help you create the perfect atmosphere to relax, focus and reminisce. 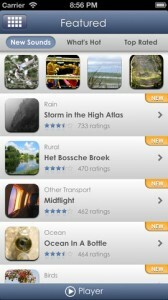 The app provides a database of sounds that you can download and listen for mental comfort and relaxation. Ambiance iPhone app can be downloaded for $2.99. Sounds have quite an influence over our minds. It can trigger our memories – good or bad. They can calm your mind or crank up the anxiety. For some, they can’t sleep without soothing music. 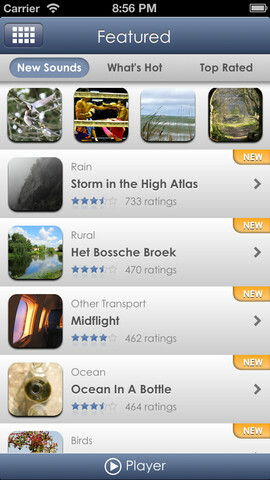 Ambiance app for iPhone brings to you a variety of sounds that you can choose to listen to in order to relax or calm yourself. The interface of Ambiance for iPhone is well laid out; you won’t have any trouble finding the icons for possible user actions. The first five icons – Featured, Store, Library, Favorites, and Downloads – provide you with options regarding how sounds are found and managed. The ‘Featured’ section let you check out the latest sounds, what’s hot at the moment, and the user rated ones. Further, clicking on a sound gives you a preview of the same alongside options to download and share the said sound. The ‘Store’ section got sounds broke up into 25+ categories. You could find the premium sounds on offer here. The ‘Download’ section displays the sounds that you’re downloading at any given moment, until it is completely downloaded. Once downloaded, you can find it in the ‘Library’ section. You can add a song to the ‘Favorites’ section by clicking on the heart icon while the song is playing. The search feature let you search out the sounds comes handy. Ambiance iPhone application also comes with several alarm clock themes. The app also let you wirelessly share sounds across iPhones, provided both the iDevices got Ambiance installed in it. Another notable feature is the ‘QuickStart’ option. If you turn it on, the app will start playing sounds as soon as you fire it up. Other features include icon shortcuts, backup capability, multiple search options, personal recorder etc. Whether you’re restless, excited, or simply want to relax, Ambiance app for iPhone could be of great help to calm yourself down. You can pick and choose the sounds you want to listen to, create customized sound mixes, or cycle through playlists until you feel that your mind is completely relaxed. New sounds are added constantly to the app means you got to listen to new sounds every few days. Verdict: Good one. PS: If you want to try Ambiance iPhone app first sans paying, a lite version of the app with limited downloads are available for free.